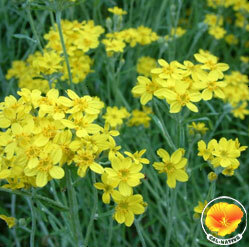 This finely textured native produces nice clusters of golden yellow blooms in the spring on a 1'-2'H x 1-2'W plant. Prefers well drained soil with very little water. Acts as an annual in many landscapes. Usually looks poor in the summer. Most often used in more natural landscapes. Attracts butterflies. Cut back after bloom in the summer but leave leaves below the cuts.